from newdawnmagazine.com: This article is a brief examination of the nature and historical roots of the Qumran community that lived and worked on the western shore of the Dead Sea around 150 BCE to 68 CE and the connections that may be discerned between it and the preaching of John the Baptist, the ministry of Jesus, and the origins of Christianity. 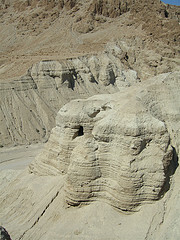 It looks through the eyes of scholars like Jozef Milik, one of the first to discover the nature of the Dead Sea Scrolls and to analyse them in depth, back in the 1950s, and the author’s analysis of the latest research now that translations of most of the Dead Sea Scrolls, discovered near Qumran, have been officially published. My previous book The Mystery of the Copper Scroll of Qumran dealt with aspects of the Dead Sea Scrolls and, more particularly, one of the scrolls that had been engraved on copper by the strange community of Essenes that inhabited Qumran. As a trained metallurgist, the use of copper by a devout Jewish sect, living by the Dead Sea around the first century BCE, had aroused my curiosity – especially as the Hebrew text seemed to be a list of buried treasures that apparently had never been found.